Alison and I have been exchanging emails the last few days. We are both weary of Tim Jackson’s adage of “being persuaded to spend money we don’t have, on things we don’t need, to create impressions that won’t last, on people we don’t care about.” We are both aware of looming sustainability problems and lifestyles, and we are both trying to live low impact lives. However despite my best attempts I am using more than my fair share according to the WWF Footprint calculator. We are not alone; a study published this year shows that conservationists often engage in environmentally harmful behaviours. We are sharply aware of the impetus to save water and energy, emit less carbon and live more sustainably. Wanting sustainability drives us to engage with society. Between the two of us we subscribe to local veggie boxes, drink fair trade coffee from keep-cups, cycle, ride-share, train commute, carbon off-set flights, go to concerts and festivals, live collectively, use green energy tariffs, eat at vegan restaurants, buy organic cotton clothes, attend seminars with international speakers, travel to participate in sustainability conferences, write articles, teach in sustainability courses, blog… There is a lot of doing stuff. Maybe we could have a better environmental footprint by doing less. Less food, less entertainment, less travelling, less energy use, less time at the office, more time snoozing in trees. 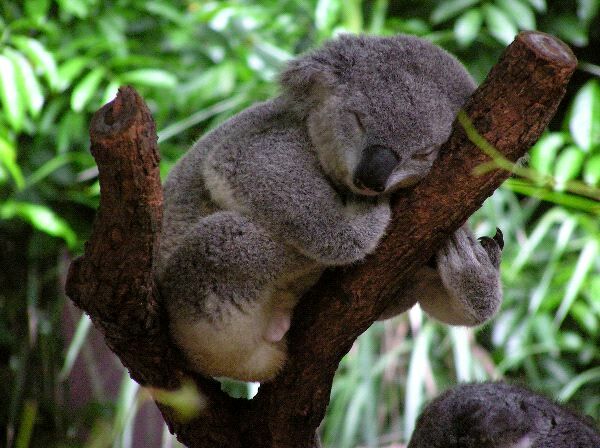 I think the koalas have it figured out.